Picture a bee. Go on—get the image in your head. Did you imagine a black-and-­yellow honeybee? There’s a good chance you did, and there’s also a good chance you’ve seen hundreds of other native bees without knowing it. Unlike nonnative honeybees, the state’s native bees vary in color, shape and size. Some are metallic green like the sweat bee, or vibrant blue like the orchard bee. Some are the size of a gnat; others can be more than an inch in length. 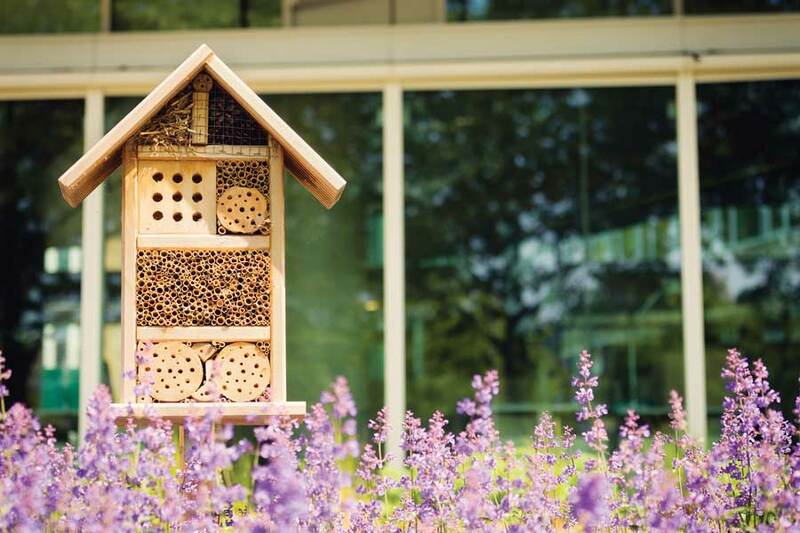 That’s partly why some local pollinator advocates, the BeeChicas, decided to build a native bee hotel in front of Boulder Public Library’s main branch last spring. BeeChicas’ Theresa Beck says, “We wanted to educate people about native bees, which are mostly solitary and nest in wood or in the ground.” About 560 native bee species flit around in Boulder County alone, and close to 1,000 species call Colorado home. BeeChicas partnered with the library and the CU Museum of Natural History to build the bee hotel as part of a public workshop. 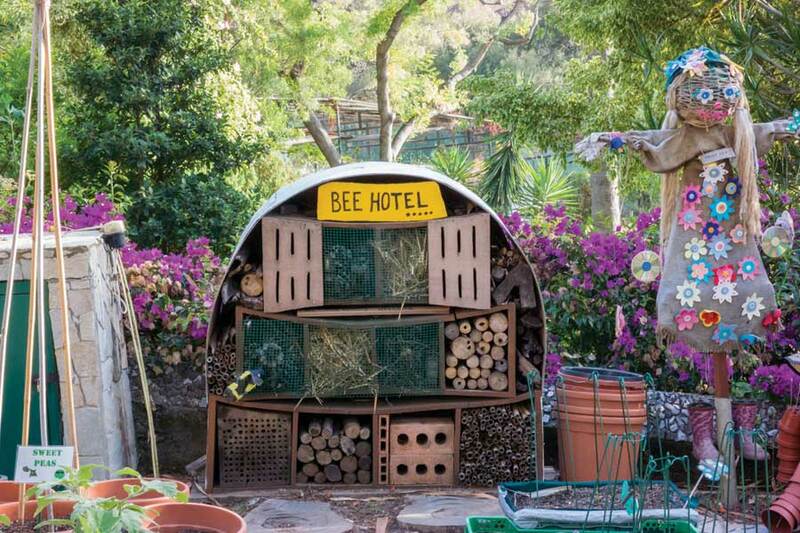 Many native bees have since built nests inside the hotel’s little wooden tunnels. They lay eggs inside the cavities and stash nectar and pollen in the hotel so their larvae will have plenty of sustenance when they emerge from the eggs. Virginia Scott, an entomologist with the University of Colorado, has identified nine species among the hotel’s residents so far. The different materials that the insects use to plug up their nest holes can help identify them. Building a bee hotel brings this educational experience into your backyard (see “Bee Hotel Basics” on opposite page). It’s a fun project for you and the kids, and you can watch hotel residents “check in” as they build their nests inside your hotel. Our native bees are very gentle, so it’s safe to observe the hotel up close. Native bees build nests between April and September and are most active during the warmest part of the day, so go out to watch them between 11 a.m. and 3 p.m. You can identify the types of bees in your hotel by checking the nest plug guide on The Bees’ Needs Blog at www.thebeesneeds.wordpress.com. ✿ Never use pesticides or herbicides on your yard. ✿ Make sure all plants you buy are neonicotinoid-free. Major agricultural corporations like Bayer and Monsanto promote this pesticide, which is lethal to bees, and it’s often not disclosed on the plant labels. If you’re not sure, ask the nursery. ✿ Don’t mulch every area in your yard. Some native bees overwinter underground, and mulch covers up potential nesting sites. ✿ Don’t disturb the ground where you don’t have to. ✿ After the growing season is over, leave pithy stems from plants like sunflowers and raspberry brambles in place. Bees can bore into them to make nests. ✿ Let dandelions and clover grow in your yard as nectar sources for bees. 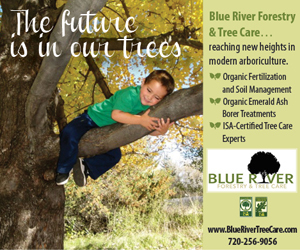 ✿ Eating locally grown organic food supports local farms, which grow a variety of forage for bees. ✿ If you’re a beekeeper, maintain strong, healthy colonies. Sick honeybees can spread diseases and parasites to local pollinators. ✿ To learn more, check out BeeChicas’ workshops on the events calendar at Boulder Public Library, contact them online at www.beechicas.com, or follow them on Instagram @beechicas. 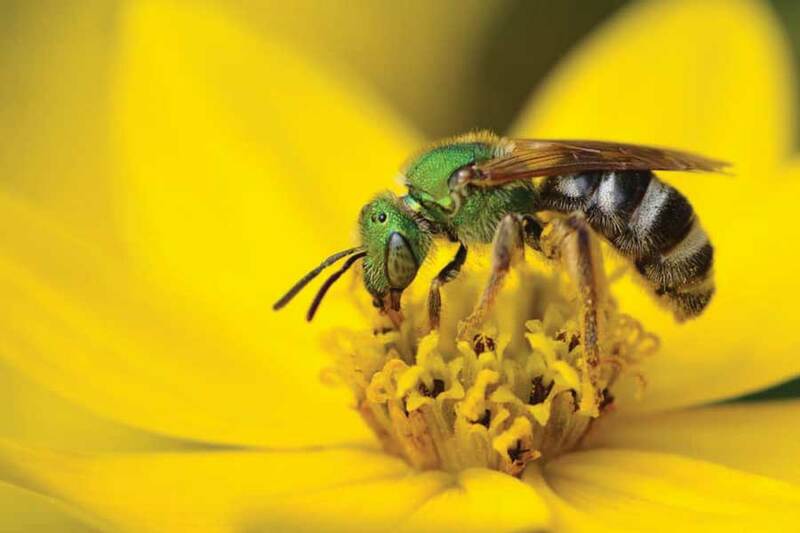 Want to help native bees? Build them a hotel. It’s safe, fun and easy, and it’s a decorative garden element. A bee hotel is essentially a wooden box with an open front. 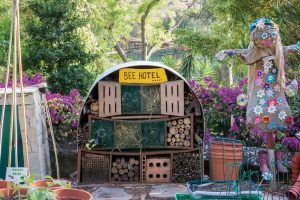 The hotel is filled with pieces of drilled wood that provide small tunnels for bees to lay their eggs in. Hollow bamboo rods also work well, and can fill in spaces between larger chunks of wood. Use untreated wood only. No stains or varnishes, as their smell can deter bees and be unhealthy for them. Drill the wood cavities ⅛ to ⅝ of an inch wide and 8 inches deep (make sure the holes don’t go all the way through the wood). Varied hole widths attract different bee species. Cut the back end of bamboo rods just past a node so the rod is naturally sealed, or seal the back end with nontoxic hot glue. Make sure all drilled holes and bamboo rods have smooth interiors. Splinters and rough wood can damage bees’ wings. 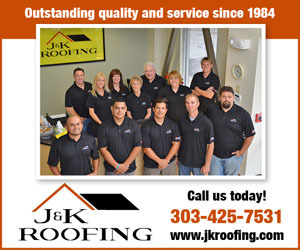 Drill holes at least ¾ of an inch away from the outer edge of your wood box. Otherwise, parasitic wasps can use ovipositors to drill through the side, hoping to lay their own eggs in a bee’s nest. Cover the open front with chicken wire so birds cannot eat the larvae. Shelter your bee hotel from rain and wind. Add a sloping roof with an overhang or keep the bee hotel beneath a covered area. Don’t be alarmed if aphid wasps take up residence in the bee hotel; they don’t hurt bees. Having the wasps around also helps your garden, as they eat aphids.